Blue Kangaroo Laundromats are America’s finest Laundromats. They have full service locations that offer a variety of washer a dryers for all of your needs. Don’t feel like doing your laundry, they will even do it for you! Blue Kangaroo provides a clean and fun environment for families and individuals to do their wash. They even have a Kids Corner at every location. 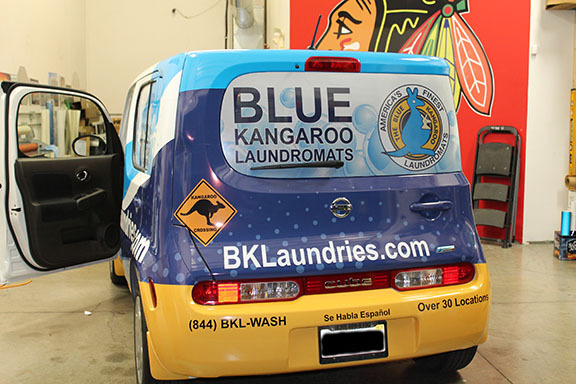 Blue Kangaroo Laundromats is expanding in the Chicago area. To help with their marketing efforts they contracted Mark Your Space to help design, fabricate and install a fleet graphics for their Nissan Cubes. Each regional General Manager has a Nissan Cube and they wanted to take advantage fleet wraps to advertise on their vehicles. This project is intended to supplement current marketing at the local level. 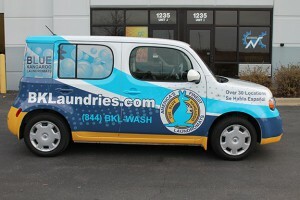 The fleet will reinforce marketing campaigns that occur through the mail, at the Laundromats, in printed material, etc. Blue Kangaroo executives approached us to help design the fleet wrap that would accomplish this. We began by meeting with company executives to discuss the overall goal of branding the vehicles with fleet graphics. The items identified as most important were: draw attention to the vehicle and store when parked at their facility, create and reinforce brand recognition, coordinate these efforts with other signage at the stores. Once we had this information in had we created two unique concepts to present to the executives. Our favorite of the two was chosen as the winner. After a couple of small tweeks to the design it was ready to go! It was a pleasure working with the group, their feedback was very valuable and spot on. Production began immediately as we needed to get five Nissan Cubes wrapped in a short period of time. We digitally printed the fleet wraps on 3M IJ180Cv3 wrap material (which comes with a 7 year warranty) and laminated them with a shiny gloss 3M laminate to make them look sharp and clean. We put our digital printer to work and began producing their masterpiece! Once completed it was time to install the fleet graphics on the Nissan Cubes. All wraps were installed at our environmentally controlled facility in Bartlett. Proper environmental controls are important. A dust free environment allows the wrap to go on perfectly with no debris getting under the wrap and showing as small bumps underneath. Temperature control is also important, too warm and the wrap material stretches, too cold and the wrap material becomes brittle and can crack. Once installed, the temperature will not adversely affect the wrap material. Installation of all five Nissan Cubes went great! They look identical and now if the managers are in the same place at the same time they have to remember their license plate or use the remote The fleet wraps help market Blue Kangaroo while parked in front of their facilities and while they are on the road going from store to store. Brand recognition and reinforcement done well supplement marketing campaigns and help generate a positive ROI. Marketing research indicates that 95% of consumers remember fleet graphics that they see. So when they need a service….what they remember is important!